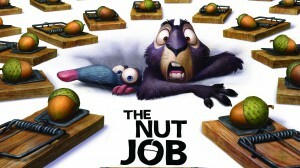 Trailers have begun to show up in the theaters for The Nut Job, a new animated GCI feature coming out this January. 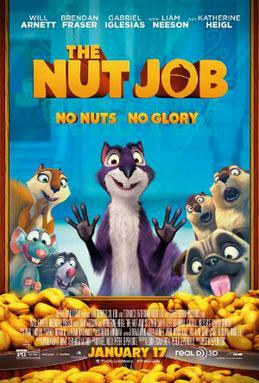 It’s based on a 2005 original animated short by director Peter Lepeniotis (Disney’s Dinosaur, Fantasia 2000) called Surly Squirrel (which you can still view on YouTube). The Nut Job tells the story of Surly (now here voiced by Will Arnett) and how he gathers together a rag-tag band of rodents with the intent of knocking over a local nut store. Needless to say, things become much more complicated — as you can see in the trailer. Interestingly, this project has been brought about almost entirely by independent studios and smaller companies. The film was produced by Toonbox Entertainment, Red Rover International, and Gulfstream Pictures, and is being distributed by Open Road Films. Should be worth noting, animator Tirrel is getting a lot of comments about the fact that he had created a similar short film with the same title years ago (but still some time after Surly Squirrel on which this movie is based. He asserts it's just a funny coincidence and "please don't witch-hunt the creators in Youtube comments." Frankly, since Tirrel's cartoon doesn't have any characters awkwardly breaking into dance or doing the "Dreamworks smile" I have to say I like his better.